This is not satire; this guide really exists and the quotes in this post really come from the CIA’s Style Manual and Writer’s Guide. People love a good secret. In fact, few things can be spread to all corners of the globe faster than something that nobody is supposed to know. 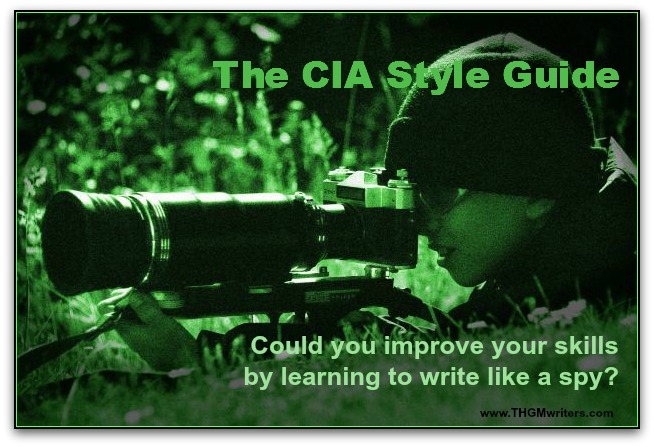 So it is little wonder that when the CIA’s Style Manual and Writer’s Guide was leaked, we got our hands on a copy without even having to double-cross anybody, steal it or escape over a wall with machine guns blaring at our backs (lucky for us). Oops. It seems I might have run afoul of the style guide already. I referred to “the” CIA above, whereas they seem to need no “the” when they speak of themselves. Most of the content of the manual is actually pretty boring, much like a spy’s life. It can’t all be sports cars, tuxes and casinos. Being a spy probably means laying hidden for days, spying through a glass at a distance, waiting for something that never happens. Don’t you just love the imagery? “The Intelligence Community.” I can just picture the CIA operatives, drinks in hand, swapping secrets (and embellishing their successes just a little) with their KGB counterparts, laughing about the good ol’ days and just generally talking shop. It all sounds just so sweet and cuddly and friendly, this Intelligence Community. Conveniently, the CIA Style Manual (did I give it an appropriately abbreviated title?) includes a metric conversion table, freeing its operatives from having to search Google to find out that one cubic inch is equal to 0.00001639 cubic meters. Section 3.3 will come in handy for those of you wanting to incorporate true spy talk into your books and blogs, but fear that you will lose readers with lengthy terms. This section lists well-known acronyms that do not need to be spelled out. Instead of losing your readers with long terms like “Organization for Economic Cooperation and Development” and “intermediate-range ballistic missile”, you can lose them with acronyms like OECD and IRBM. For a guide seeking to spread clarity, I must confess that I am totally unclear on how I should refer to the UK…or to the United Kingdom…or is it Britain? Maybe after reading this, you can help me out? If you were wondering where the CIA stands on the indefinite article before an acronym beginning with a consonant that sounds like it starts with a vowel (whether to write “a FDA recall” or “an FDA recall”), they stand firmly for the sound: an FDA recall. It’s right there on page 56. Fortunately, it does not tell us to avoid “expected surprise” or “dubious logic”, so we can still have some fun when reporting on the dubious logic of the expected surprises that North Korea has in store for the rest of the world. But earlier in the Manual, we are warned that “both” is redundant when used in “they both agree”. So there. You’ve been told. Along similar lines, we read on page 150 that we have to be careful when we report on casualties. Let’s face it, anybody killed and wounded has been killed. “Killed and wounded” would be a redundancy. But people killed or wounded includes also people who have been wounded but somehow failed to die. Hmm. Isn’t “killed or wounded” also a redundancy? Can’t we just say “wounded”? I mean, that also covers anybody killed, doesn’t it? Funny thing…I didn’t see any quote so colorful in there when I was snoozing through it. If you find anything interesting that I missed, feel free to report on it in the comments below. The full text can be found here. I am officially hooked onto your writing. You’ve got yourself a fan, David. When do I get my T shirt?